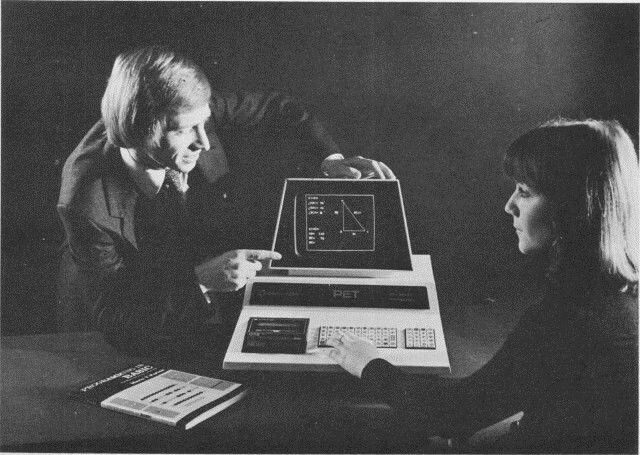 The story of PET begins with the development of the 6500 series of microprocessors by MOS Technology which then became the heart of the KIM I microcomputer system. Less than eighteen months ago Commodore acquired MOS Technology to give us our own in-house chip processing and design. Since then KIM I has become the best selling microcomputer system in the USA. (It is now available in the UK for £149 plus VAT). PET effectively graduated out of the KIM I – the whole project taking less than a year from the first development “go ahead” given by Commodore after we realised the vast potential such a system could have and the fact tht we now had the necessary in-house technology, production and marketing capability for the fascinating PET project. What Was The Design Philosophy? upgraded as the heart of an extremely powerful system. 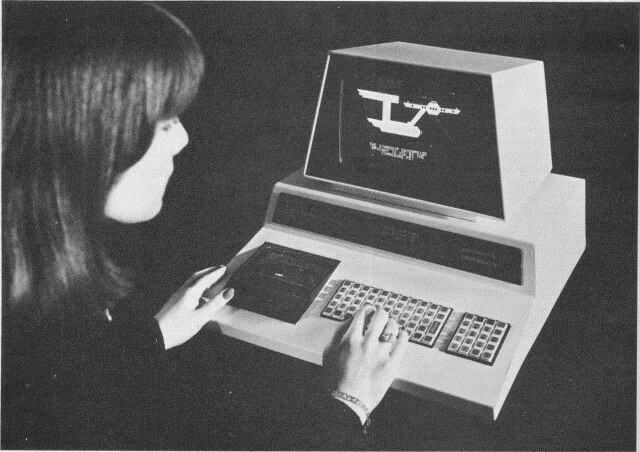 For this reason we built in an IEEE-488 output (often known as the H. P-1 B) which allows for multiple intelligent peripherals – we have under development our own printer and floppy disc. expandable in 8K increments up to 32K and these will in the future be offered as optional extras. There is also a parallel user port and a second cassette interface (the second cassette is another optional extra). I 0 is managed by built in operating system software. We have tried to take some of the mystique out of computers in order to broaden people’s understanding, appreciation and-potential use. For this reason we chose an expanded, fast, comprehensive and powerful 8K Basic which has been built into the machine (part of our 14K Rom) as this is one of the easiest computer languages to learn, understand and use. There is also machine language accessibility for the professionals. When you open up a PET to look inside you will immediately realise it has been designed for ease of servicing and economic mass production techniques. 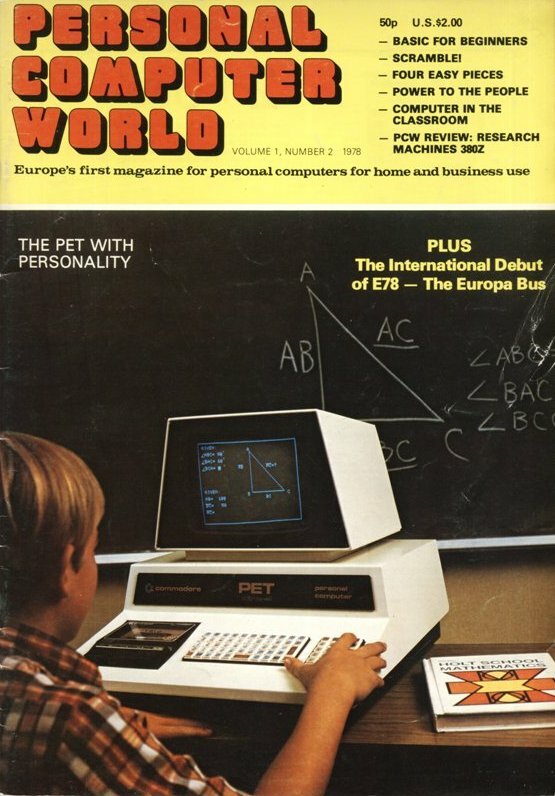 The PET consists of only three p.c. boards – the main board which can be snapped out and easily replaced in the event of any defect and the other two boards which are for the CRT circuit and the cassette recorder (specially modified), both of which are removable and replaceable for ease of servicing- and assembly, of course! As an International Corporation we have already made major investments in this market and our efforts will be continuing in three areas. peripherals, software and marketing. All of which are going to be extremely important. of you who can wait, the prices are not likely to be out of proportion to the very reasonable cost of the PET computer itself. We do believe in passing on the benefits of mass production to keep us ahead. We recognise the importance of this area which is one of the reasons we have started our UK PET Users Club already. We recognise the fact that some of the best software created for PET will probably not come from us but from those of you who buy PETs and develop really useful programs for your own needs. We want users to share this with all owners and are offering four free programs for every program sent to us that we accept into the library. Coming with the computer will be a programming manual fully describing our excellent Basic in addition to the general manual. The Users Club will also be regularly putting out extra information on the areas users tell us they most want to know about. We don’t intend to inflate the price of our computer by charging you initially for a lot of very expensive, specialised software we have developed and you may well not want. In addition to Basic software, we offer a very comprehensive programming manual on the machine language of our own MOS 6502 microprocessor, which is at the heart of PET, so programming can be done in Basic or Machine language. Incidentally, not everyone is aware that lower case letters are available within PET via POKE commands that switch the upper case functions between this and the graphic functions actually printed on the keys. What About Marketing? One of the key elements in achieving the breakthrough we have in the price specification ratio is to take a different approach to the market from many traditional computer companies. We do not intend to employ a several hundred strong sales force to wine and dine would-be customers and, if successful, get a commission quite possibly more than the price of our own computer for what in specification is a similar unit. We believe that it is better to pass this saving on to the customer and, if he is as sensible as we happen to believe he is, the PET itself and the owners are going to be the best salesmen we can have – again, initial reaction seems to prove we are right. However, we do recognise the importance of certain types of marketing which is why we have set up a completely new division of Commodore here in the UK (Commodore Systems). This will handle PET, KIM and allied products under development. Commodore Systems will be a small team of specialists designed to back up and develop the market for an excellent product and not a big sales team to push another ‘me too’ product. As production and our organisation grows, we intend expanding to a local dealer network to give grassroots support – these will be carefully selected. Meanwhile we are already setting up new offices and a “PET Computer Centre” in Central London (open sometime in April at 360 Euston Road) which we hope users and others interested will visit to evaluate PET, exchange ideas and generally use as a ‘Personal Computer Centre’. We’ll let Personal Computer World know just as soon as we have a moving date fixed.